The kid in the ski cap pulled off the jumper cables and shook his head. A cloud of frost filled the kid’s face and he let out one long breath. He glanced around. The parking lot at the highway rest stop was nearly empty. Christmas morning, don’t ya know, he thought. “Okay, let me rev my car for a minute. Maybe that will kick up a charge. After he reconnected the cables the kid leaned into his Mazda and with his right foot, pressed the accelerator. The car was warm and the kid shook off the cold as the heat rose through the open door. The old man turned the key. A click or two, but no juice. He tried again. Nothing. 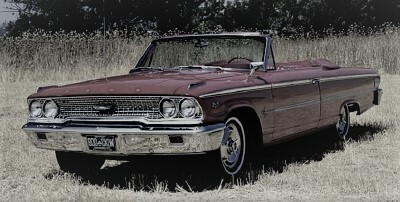 The old man stared at the dead engine to his 1963 Ford Galaxie 500 XL. One head light was offline because of an accident. The tires were bald and the engine sputtered on bad spark plugs. They shook hands. “Merry Christmas,” the old man said. The kid slipped into the front seat, shut the door, nodded and backed the car away. The old man shut the Ford’s hood and patted the metal. He had driven what seemed like a million miles in that car. All over the country. Highway, backroads. What a car. Big block V-8 convertible, dual exhaust. Brought smiles in parking lots. A rocket on the road. Top-down trips left him sunburned and stiff-haired. And for some months, his home. And now like him, past its time. He shook off the hollowness and scrounged for a piece of paper so he could leave a note on the dash. He just wrote his name and the town where he was headed. It wasn’t his home, but was a destination. Maybe they’d understand. He gathered his backpack and the package, paused a second, then put the car key in the ignition and closed the door. The yellow-gold parking lot lights fought off the early morning sunlight starting to squeeze through a gap in the leaden sky; snow would follow. Inside, he bought a cup of coffee and sat near the window as the weight of it all crashed. The warmth of the room set his nose to running and wiped it on his sleeve. Outside, the sparkling of the first few snowflakes glittered the air. He topped off the coffee and left, standing for a moment as undecided as the day, wanting hope and cheer, but offering gloom. He watched the steaming big rigs angled into parking spots. Maybe there’s a ride, he thought, then backed off begging. But he had to get to her. The old man shrugged no. “I’ll grab us something to go,” the driver said. The old man crawled into the extended cab and stretched out. The old man rolled in and out of sleep; in between CB chatter, the trucker sang along to the music that softly dulled the highway sounds. He had left her. Job change, fired. Pulled back into himself to move on, but she hung on at the edge of his memory, her eyes dark and soft, both inviting and sad, her lips tender and body exciting. He had loved her but never told her. It’s like that. That whirlwind of loss and regret, pride and defense that slips into stubbornness, and then a sour absence. He felt a hand on his shoulder and shook himself awake. Then old man rubbed the steam off the window and glanced into the street. Standing in the cold street, the old man nodded one last thanks. “No worry, friend. We’re all travelers. We all have a pilgrimage to make. Peace, man.” And he mounted the cab and drove away. The roses he had left before had browned and stiffened. Dead petals littered the ground; he brushed them away, and then pushed away the grey snow and oak leaves that attached themselves. He had finally found her and for a moment that brief reunion had brought them both joy. But there had been too much time between. He had stood in the back of the church and watched her weeping family bewail her life taken too soon. He had followed the procession, but watched the service from the street, too shamed by his absence to participate. He didn’t want to explain who he was or why he was there, still wrapped in his uncertainty. He came alone, later, just at the edge of darkness. And then came back again every year. He placed the fresh roses on the grave and the laminated letter and ran his fingers over the letters of her name. One last time. He smiled sourly. All the things I never said. For all those years, and he knew it was never enough. That’s what her smile said, what her voice said. It was not your fault, she had told him that last time. I knew where you were, but never reached out. Running we were, in different directions, coming back to each other, but it took too long. No one is to blame. He coughed and felt as the pain in his lungs grabbed his heart. Weeks, they said. Running still, he thought. One last turn. This entry was posted in Hot in Hunterdon; Georjean Trinkle, Imzadi Publishing LLC, Michael Stephen Daigle, www.michaelstephendaigle.com and tagged "A Game Called Dead", "The Swamps of Jersey" Imzadi Publishing, "The Weight of Living", "Who shot the smart guy at the blackboard? ", Anita Dugan-Moore., Audible.com, Big NYC Book Awards, Fiction, Frank Nagler, Independent Press Award, Kirkus Reviews, Lee Alan, Michael Stephen Daigle, Royal Dragonfly Book Award, Shelf Unbound Indie Book Awards. Bookmark the permalink.